There's one doughnut flavor that will never leave the menu: the Brown Butter. It's the doughnut that "started it all." Despite being open for more than a year, the artisan doughnut and coffee shop, Good Dough, is continuing to take Jacksonville by storm, offering new and returning flavors each month to its customers. Even so, one doughnut flavor that will never leave the menu is the Brown Butter, which the owner Logan Moore said is the doughnut that "started it all." "In addition to being delicious, it kind of holds that special place in our hearts," Moore said. "It's kind of the first one that got things rolling with us." Like all of their doughnuts, the Brown Butter doughnut is hand-made from scratch. It's made by melting butter and cooking it to the point where it starts to brown, which then creates a nutty flavor. 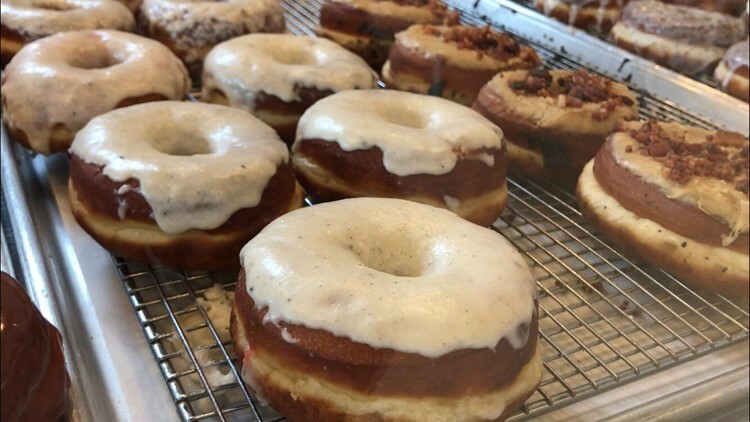 Brown Butter is also one of the most popular doughnuts sold at Good Dough, and it's the doughnut Moore recommends new customers try, and returning customers continue to enjoy. "Then I'd recommend something they might not have had before, something interesting and unique that we've been doing," Moore said. "We'd like to expose them to overall flavors and something new we are trying out." The Brown Butter doughnut is a popular doughnut at Good Dough and it's the one that started it all, said Logan Moore, the owner. Photo: FCN. Good Dough rolls out new sweet and mouth-watering flavors every month; some of these flavors are brand new while others could be returning favorites. "In the case on any given day, we have 15 to 17 flavors," Moore said. Like the Brown Butter, there are about seven flavors that will be available every day, such as the Molly Ringwald (a creamy raspberry glazed doughnut with sprinkles), salted caramel, butterscotch bacon and "a milk chocolate of some sort with sprinkles or glazed," Moore said. All of their doughnuts range between $2.50 to $3.25 plus tax. And just like their doughnuts, Good Dough also offers customers a unique twist to sandwiches, which they call "doughwiches." They're made from the same dough that creates their doughnuts. This month, customers can try their BLT doughwich or good salad. Everyday, customers can try their ham, egg and cheese doughwich, the ever-popular fried chicken doughwich, and the customer favorite avacado dough-oast. The avacado dough-oast originally started as a temporary menu item, but customers were so delighted by its taste and savory flavor that it became a permanent item. It's made on a toasted doughnut, Mascarpone cheese spread, avacados, sesame seads, salt, pepper and local company, B and D hot sauce. The sandwiches range from $5 to $6.75 plus tax. Melissa Guz is a digital producer and reporter for First Coast Foodies. Follow her on Twitter @mguznews or on Instagram @fcnfoodies. Don't forget to check out her videos posted on the First Coast News Facebook page, but you can also check them out here.